As an unincorporated community, Bethesda has no official boundaries. The United States Census Bureau defines a census-designated place named Bethesda whose center is located at 38°59′N 77°7′W﻿ / ﻿38.983°N 77.117°W﻿ / 38.983; -77.117. 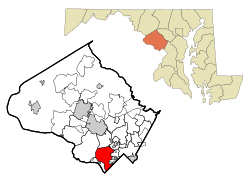 The United States Geological Survey has defined Bethesda as an area whose center is at 38°58′50″N 77°6′2″W﻿ / ﻿38.98056°N 77.10056°W﻿ / 38.98056; -77.10056, slightly different from the Census Bureau's definition. Other definitions are used by the Bethesda Urban Planning District, the United States Postal Service (which defines Bethesda to comprise the ZIP Codes 20810, 20811, 20813, 20814, 20815, 20816, and 20817), and other organizations. According to estimates released by the U.S. Census Bureau in 2013, the community had a total population of 63,374. 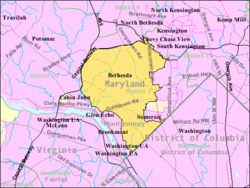 Most of Bethesda's residents are in Maryland Legislative District 16. Bethesda is situated along a major thoroughfare that was originally the route of an Indian trail. Henry Fleet (1602–1661) was an English fur trader and the first European to travel to the area, which he reached by sailing up the Potomac River. He stayed with the Piscataway tribe from 1623 to 1627 as both a guest and a prisoner, then returned to England. He spoke of potential riches in fur and gold, and won funding for another American expedition. Most early settlers in Maryland were tenant farmers who paid their rent in tobacco, and colonists continued to push farther north in search of fertile land. Henry Darnall (1645–1711) surveyed a 710-acre (2.9 km2) area in 1694 which became the first land grant in Bethesda. and tobacco farming was the primary way of life in Bethesda throughout the 1700s. The establishment of Washington, D.C. in 1790 deprived Montgomery County of its economic center at Georgetown, although the event had little effect on the small farmers throughout Bethesda. Between 1805 and 1821, Bethesda became a rural way station after development of the Washington and Rockville Turnpike, which carried tobacco and other products between Georgetown and Rockville, and north to Frederick. A small settlement grew around a store and tollhouse along the turnpike by 1862 known as "Darcy's Store", named after the store's owner William E. Darcy. The settlement was renamed in 1871 by postmaster Robert Franck after the Bethesda Meeting House, a Presbyterian church built in 1820. The church burned in 1849 and was rebuilt the same year about 100 yards (91 m) south, and its former location became the Cemetery of the Bethesda Meeting House. Bethesda did not develop beyond a small crossroads village through the 19th century, consisting of a blacksmith shop, a church and school, and a few houses and stores. In 1852, the postmaster general established a post office in Bethesda and appointed Rev. A. R. Smith its first postmaster. A streetcar line was established in 1890 and suburbanization increased in the early 1900s, and Bethesda began to grow in population. Communities that were situated near railroad lines had grown the fastest during the 19th century, but mass production of the automobile ended that dependency and Bethesda planners grew the community with the transportation revolution in mind. This included becoming a key stopping point for the B & O railroad on their Georgetown Branch line completed around 1910 that ran from Silver Spring to Georgetown, passing through Bethesda on the way. The branch had a storage yard there and multiple sidings that served the industries in Bethesda in the early 20th century. B & O successor CSX ceased train service on the line in 1985, so the county transformed it into a trail in the rails-to-trails movement. The tracks were removed in 1994 and the first part of the trail was opened in 1998; it has become the most used rail trail in the United States, averaging over one million users per year. Subdivisions began to appear on old farmland in the late 19th century, becoming the neighborhoods of Drummond, Woodmont, Edgemoor, and Battery Park. Farther north, several wealthy men made Rockville Pike famous for its mansions. These included Brainard W. Parker ("Cedarcroft", 1892), James Oyster ("Strathmore", 1899), George E. Hamilton ("Hamilton House", 1904; now the Stone Ridge School), Luke I. Wilson ("Tree Tops", 1926), Gilbert Hovey Grosvenor ("Wild Acres", 1928–29), and George Freeland Peter ("Stone House", 1930). In 1930, Dr Armistead Peter's pioneering manor house "Winona" (1873) became the clubhouse of the Woodmont Country Club on land that is now part of the National Institutes of Health (NIH) campus. Merle Thorpe's mansion "Pook's Hill" (1927, razed 1948) became the home-in-exile of the Norwegian Royal Family during World War II. World War II and the subsequent expansion of government further fed the rapid growth of Bethesda. 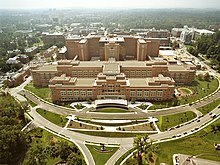 Both the National Naval Medical Center (1940–42) and the NIH complex (1948) were built just to the north of the developing downtown, and this drew government contractors, medical professionals, and other businesses to the area. In recent years, Bethesda has consolidated as the major urban core and employment center of southwestern Montgomery County. This recent growth has been vigorous following the expansion of Metrorail with a station in Bethesda in 1984. Alan Kay built the Bethesda Metro Center over the Red line metro rail which opened up further commercial and residential development in the immediate vicinity. In the 2000s, the strict height limits on construction in the District of Columbia led to the development of mid- and high-rise office and residential towers around the Bethesda Metro stop, effectively creating a major urban center. In the CDP, the population was spread out with 21.8% under the age of 18, 4.6% from 18 to 24, 29.2% from 25 to 44, 27.1% from 45 to 64, and 17.2% who were 65 years of age or older. The median age was 41 years. For every 100 females, there were 87.7 males. For every 100 females age 18 and over, there were 84.0 males. Bethesda is a very wealthy and well-educated area. According to the 2000 Census, Bethesda was the best-educated city in the United States of America with a population of 50,000 or more. 79% of residents 25 or older have bachelor's degrees and 49% have graduate or professional degrees. According to a 2007 estimate, the median income for a household in the CDP was $117,723, and the median income for a family was $168,385. Males had a median income of $84,797 versus $57,569 for females. The per capita income for the CDP was $58,479. About 1.7% of families and 3.3% of the population were below the poverty line, including 1.8% of those under age 18 and 4.1% of those age 65 or over. Many commute to Washington, D.C. for work. The average price of a four bedroom, two bath home in Bethesda in 2010 was $806,817 (which ranks it as the twentieth most expensive community in America). Bethesda is often associated with its neighboring communities, Potomac, Chevy Chase, Great Falls, Virginia, and McLean, Virginia, for their similar demographics. In April 2009, Forbes ranked Bethesda second on its list of "America's Most Livable Cities". In October 2009, based on education, income, health, and fitness, Total Beauty ranked Bethesda first on its list of the U.S.'s "Top 10 Hottest-Guy Cities." In 2009, Self magazine ranked Bethesda as the second healthiest place for women in the country, a year after ranking it number one. As of 2009, eight Pulitzer Prize winners live in Bethesda, as do several well-known political commentators (including George Will, David Brooks, and Thomas Friedman). In 2014, it placed first on both Forbes' list of America's most educated small towns and Time's list of top earning towns. The headquarters of defense conglomerate Lockheed Martin, managed health care company Coventry Health Care and hotel and resort chains Marriott International and Host Hotels & Resorts, Inc. are located in Bethesda. Software company Bethesda Softworks was originally located in Bethesda, but moved to Rockville, Maryland, in 1990. The Discovery Channel also had its headquarters in Bethesda before relocating to Silver Spring in 2004. On the professional services side, numerous banks (PNC, Capital One Bank) brokerage firms (SmithBarney, Merrill Lynch, Charles Schwab, Fidelity) and law firms (Ballard Spahr, JDKatz, Paley Rothman, Lerch Early & Brewer) maintain offices in Bethesda. Bethesda has two farmers markets, the Montgomery Farm Woman's Cooperative Market and the Bethesda Central Farmer's Market. Federal Realty Investment Trust (FRIT) has developed much of the west side of downtown Bethesda into an area called Bethesda Row. The vibrant district includes an Apple Store, an Amazon Books location, a cinema, and dozens of shops and restaurants. Also located in downtown Bethesda is one of the Madonna of the Trail monuments, erected by the National Old Trails Association working in concert with the Daughters of the American Revolution; President Harry S Truman presided over the dedication of the Bethesda monument, on April 19, 1929. Nearby is the Bethesda Post Office. Also starting in the heart of downtown Bethesda, is the Capital Crescent Trail which follows the old tracks of the B&O Railroad stretching from Georgetown, Washington, D.C., to Silver Spring, MD. Walter Reed Medical Center and the Bethesda Theater are two important Art Deco architectural structures in the suburbs surrounding Washington, D.C.
Bethesda is the home of Congressional Country Club, which is recognized as one of the most prestigious private country clubs in the world. Congressional has hosted four major golf championships, including the 2011 U.S. Open, won by Rory McIlroy. The AT&T National, hosted by Tiger Woods, has been played at Congressional four times. Bethesda is also home of the exclusive Burning Tree Club, Bethesda Country Club, and the Bethesda Community Baseball Club, which operates the Bethesda Big Train, a summer collegiate baseball team. The Washington Japanese Language School (WJLS, ワシントン日本語学校 Washington Nihongo Gakkō), a supplementary weekend Japanese school, holds its classes at the Stone Ridge School of the Sacred Heart in Bethesda. The WJLS maintains its school office in North Bethesda, adjacent to Garrett Park. The institution, giving supplemental education to Japanese-speaking children in the Washington, D.C. area, was founded in 1958, making it the oldest Japanese government-sponsored supplementary school in the U.S. Downtown Bethesda is managed by Bethesda Urban Partnership, a non-profit organization established in 1994 by Montgomery County. Washington Metro's Red Line services two primary locations in Bethesda: the downtown area at the Bethesda, and the area near the National Institutes of Health and the Walter Reed Medical Center at the Medical Center Washington Metro stations. The Maryland Transit Administration's Purple Line, a light-rail rail currently under construction, will provide a direct connection from Bethesda to Silver Spring, the University of Maryland, College Park, and New Carrollton. The Purple Line will allow riders from Bethesda to move between the Red, Green, and Orange lines of the Washington Metro transportation system, as well as to MARC and Amtrak trains, without needing to ride into central Washington, D.C.
Bethesda Circulator, a free loop bus that operates Monday-Saturday and covers most of downtown Bethesda. Tripper Bus, a privately owned company, provides service from Bethesda at the southwest corner of Elm Street and Wisconsin Ave to New York City between 8th and 9th Ave near Penn Station, in close to proximity to Port Authority Bus Terminal. Bethesda is mentioned in a 1994 episode of The Simpsons, a 2009 episode of 24, a 2013 episode of Family Guy, a 2013 episode of Homeland, and a 2013 episode of Scandal. It is also featured in several episodes of the American science fiction television series The X-Files, the American drama series The Americans, the Canadian mini-series XIII, as well as the American space opera Babylon 5, where it is home to the Bethesdadome, the medical headquarters of the Earth Alliance. The book The Overachievers follows students enrolled at Bethesda's Walt Whitman High School. Bethesda is mentioned in Space Ghost Coast to Coast of episode 81 "Knifin' Around" by Space Ghost himself. "Well, love is about compromises, Zorak. Compromising your future to the city council of Bethesda, Maryland" (as an unincorporated town, Bethesda actually has no city council). Sean Murray, actor, most famous for playing agent 'Timothy (Tim) McGee' in NCIS & the teenage Thackery Binx in Disney's Hocus Pocus; (1993 Film). ^ "Factfinder". United State Census. Retrieved 2014-11-17. ^ a b c d "History of Bethesda". Fox Hill Residences. Retrieved October 13, 2015. ^ a b c Offutt, William; Sween, Jane (1999). Montgomery County: Centuries of Change. American Historical Press. pp. 161–162. ^ "Maryland New Post-Office". The Baltimore Sun. January 7, 1852. p. 2. ^ "Census of Population and Housing". U.S. Census Bureau. Archived from the original on 2013-10-01. Retrieved 2007-03-19. ^ "U.S. Census Bureau: Bethesda CDP". ^ Clabaugh, Jeff (2010-09-22). "Bethesda ranks #20 on expensive homes list". ^ Greenburg, Zack O'Malley (2009-04-01). "America's Most Livable Cities". Forbes. Retrieved 2009-06-03. ^ "Top 10 Hottest-Guy Cities". Retrieved 2009-10-22. ^ "The healthiest places for women". ^ "Best place to live". ^ Susan Adams (30 July 2014). "The Most Educated Places In America In 2014". Forbes. ^ "Top Earning Towns". 19 September 2014. ^ "SRMap2015.pdf[permanent dead link]." Washington Japanese Language School. Retrieved on April 16, 2015. ^ a b "Home" (Archive). Washington Japanese Language School. Retrieved on April 16, 2015. "学校事務局 Holy Cross Church, Quinn Hall 2F. 4900 Strathmore Avenue, Garrett Park, MD 20896[...]校舎 ストーンリッジ校 Stone Ridge School of the Sacred Heart 9101 Rockville Pike Bethesda, MD 20814"
^ "Map" (Archive). Town of Garrett Park. Retrieved on April 30, 2014. ^ "2010 CENSUS - CENSUS BLOCK MAP: North Bethesda CDP, MD" (Archive). U.S. Census Bureau. Retrieved on April 30, 2014. ^ "English Archived 2014-05-02 at the Wayback Machine." Washington Japanese Language School. Retrieved on April 30, 2014. "Washington Japanese Language School c/o Holy Cross Church, Quinn Hall, 4900 Strathmore Avenue, Garrett Park, MD 20896"
^ "Andrew M. Saidel" (Archive). Japan-America Society of Greater Philadelphia (JASGP; フィラデルフィア日米協会とは). Retrieved on April 16, 2015. ^ "Poet Lore archives". onlinebooks.library.upenn.edu. Retrieved 2018-01-18. ^ Di Caro, Martin (August 28, 2017). "Everything You Need To Know About The Purple Line". WAMU. Retrieved 2018-01-04. ^ "Project Overview - Maryland Purple Line". www.purplelinemd.com. Retrieved 2018-01-04. ^ "Tripper Bus Service - Bus Pick-Up Locations". ^ "Tripper Bus Service - Bus Pick-Up Locations". Tripperbus.com. Retrieved 2017-06-25. ^ Lee, Youyoung (2013-10-28). "Saul Gets The Pink Slip". Huffington Post. ^ "Red Auerbach Dies at 89". ^ "The Deane of amateurs wins again". ^ "Hoax emergency message sends police to Wolf Blitzer's house in Bethesda". ^ "Washington Business Report – Nov. 23, 2014". ^ "10 Things You May Not Know About Me: Michael Cerveris of 'Fun Home'". Archived from the original on 2015-07-02. Retrieved 2015-08-21. ^ "15 Celebrities Who Grew Up Here". ^ "Tight end Colin Cloherty '09 has a 'crazy ride' as an NFL rookie". ^ "CNN's new anchor Candy Crowley is not your typical broadcaster". ^ "John Feinstein: The Sporting Life". ^ "Tom Friedman Writes What's Wrong". ^ Andrew Metcalf, Obama Nominates Bethesda Resident Merrick Garland to Serve on U.S. Supreme Court, Bethesda Magazine (March 16, 2016). ^ "We Knew Them When". ^ a b "Bethesda, Chevy Chase Homes of The Rich and Famous". ^ &#151;Spike Jonze. "Spike Jonze - Film Actor, Screenwriter, Actor, Director, Producer, Television Producer". Retrieved 2017-06-25. ^ "Bethesda Big Train Gearing Up For Holiday Auction". ^ "Bethesda native Katie Ledecky smashes swimming records in Russia". ^ "Nils Lofgren Bio". Wamadc.com. 1951-06-21. Retrieved 2017-06-25. ^ "Maryland alum Justin Maxwell hitting his stride". ^ "Allison Macfarlane in the hot seat". ^ "5 Things You Should Know About Martin O'Malley". ^ "Maury Povich Biography". Archived from the original on 2016-01-13. Retrieved 2015-08-14. ^ "13 Questions for Alexandra Robbins". ^ "About Actor Richard Schiff". ^ "Quickish founder Dan Shanoff joins the USA TODAY Sports Media Group". ^ "David Simon of 'The Wire': Former high school muckraker". ^ "Gordon Smith finds happiness in private sector, has no plans to seek office". ^ "Famous Faces from Montgomery County". ^ "Michael Wilbon: sports writer turned TV star".